SaaS companies are quite literally changing the face of business. Seemingly every day new tech-driven solutions are challenging the status quo of the ways business communicate and share information. While new developments in technology are obviously crucial to progress in any industry, what some SaaS companies fail to do is remember the single most crucial shared characteristic of their audience: they’re human. Not capitalizing on the imagination of your audience is like trying to fix your printer by having a conversation with it. It simply isn’t what works. If we don’t try to talk to computers with human language, why do we try and do the opposite? Keeping things simple may sound simple, but too often SaaS companies get in their own way and try to throw too much at their audience when marketing their product. If nothing else, simplicity is everything. As humans, we crave it. And perhaps the only thing smaller than our tolerance for complexity is our fleeting attention spans. The most effective language around SaaS products are the ones that waste no time in explaining exactly how it benefits a user. Take 1Password for example: it’s a computer software that protects a variety of important log-ins and passwords from hackers or thieves. While 1Password is composed of an intricate security vault system, they simply speak to what the consumer truly cares about: safety. 1Password is advertised as simple, convenient security, which loosely translated, means peace of mind. 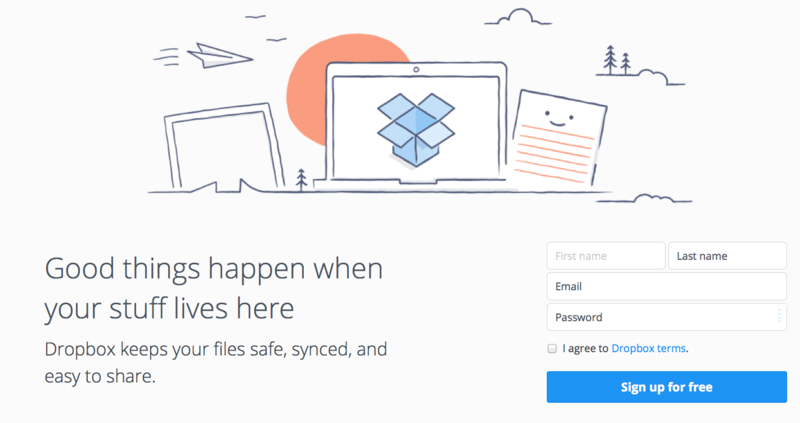 Dropbox’s branding similarly embodies this tactic – their leading message on their homepage reads: Good things happen when your stuff lives here. Much like 1Password, they focus on a simplified benefit of the product. It’s conversational. The incredible complexity and technology behind Dropbox has been boiled down to the most basic and straightforward conclusions that could possibly be drawn, thus appealing on an emotional level to the humans who use it. This would be a technique perhaps best used during investor presentation or initial product demo to simply explain what it is your product or service is all about. Even when speaking to a tech-savvy audience (which isn’t always the case), we encourage our clients to draw parallels and metaphors to help explain their product’s problem, solution, technology etc. By bringing complex information back into ideas and concepts that anyone can understand, you can eliminate gaping question marks very quickly. For example, say you’re pitching your SaaS platform that helps unify and monetize data sets and algorithms in the climate research space. Rather than diving head first into the back end framework and development strategy, consider stepping back and explaining the fundamental problem using a concept anyone can understand. Imagine you wake up tomorrow and decide to become a farmer. You buy 200 acres of land to grow a combination of corn, beans. wheat, etc. You plant thousands and thousands of seeds in fertile ground and wait for mother nature to play it’s part. Only it never does. Your seeds have been planted by they lay dormant without a little help from mother nature. Now imagine the farmer on the plot of next to you has the exact opposite problem. His land has been flooded with rain and the sun is shining, only there’s just one problem. He has no seeds. Both farms have incredible potential to grow useful crops, yet they both don’t have access to the things they need on their own. Paint a picture in your audience’s mind and not only will you win their attention immediately, but you’ll dispel any confusion about exactly what it is your product is all about. Everything we do as people – from the toothpaste we buy to the car we drive – everything is governed by what we believe. Beliefs polarize, galvanize and inspire us into action. The best marketers are the ones who take advantage of this reality and build bold communication strategies that tell the world what they stand for. Take one of the hottest communication platform SaaS companies in Slack for example: Their tag simply reads “Be less busy”. With three simple words, Slack is telling you that they understand the crazy workload you have to endure and that they believe something can be done about it. They tell you that they believe a fundamental flaw exists in the way businesses are run. While claiming that businesses should address their communication issues is certainly nothing new, claiming that they have a platform that could “end email” separates Slack from both competitors and potential customers who believe that email has become a sacred cow of the business world. For Saas companies that similarly serve as networks, such as LinkedIn, this step is exceptionally important because those beliefs are what attract users. As a business oriented social networking site, LinkedIn believes that individuals should be in control of their professional identity and should have the opportunity to engage with likeminded, professional individuals. Therefore, those users who believe that a professional networking site is beneficial will use it, thus perpetuating the belief and creating a community of humans who feel the same way. By using this belief as the foundation for the way they talk about their services, they’ve allowed us to connect with them in a way that’s as aspirational as it is human. About the Author: Maxx Parcell is the lead Content Writer and Developer at SquarePlanet in Chicago, IL. His job is to help our clients tell their story more effectively. Including anything from sales pitches to full brand message strategy, we work to help people improve the way they communicate and connect with people. We do things a bit differently. We believe in being pirates. For more information about exactly what that means and to read our own blog, please visit SquarePlanet.com.